These sitelinks appear to be from an internal page on this site. Sitelinks appearing for an internal page on the site. 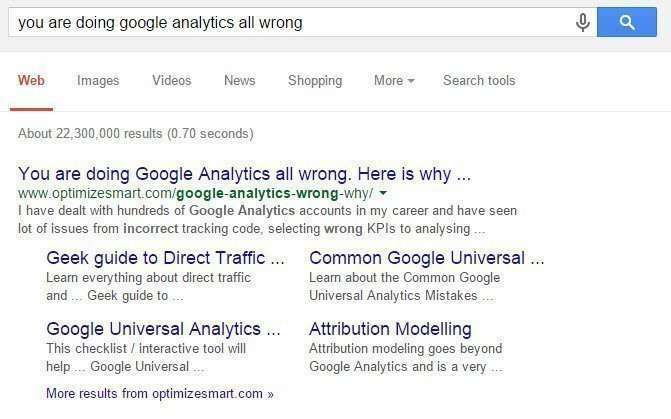 Sitelinks for a blog post, in Google search results. 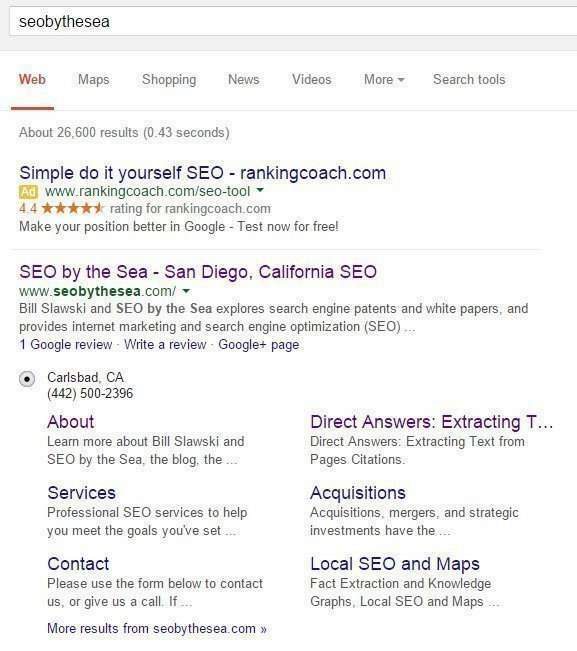 The quicklinks for this search result shows off prominently placed links on the page listed in the results. … help users navigate your site. Our systems analyze the link structure of your site to find shortcuts that will save users time and allow them to quickly find the information they’re looking for. Two of those articles describe how Google may choose some links on a page that may pass along more PageRank than other links. It appears that these new patent filings involving which links are chosen to be displayed in search results also use a similar approach to show off sitelinks. A score is given to sitelinks that appear upon pages, that seems to be based on the visual location where that link appears upon that page. The method may also assign a score to each hyperlink, of the plurality of hyperlinks based on a click-through rate corresponding to each hyperlink of the plurality of hyperlinks. The patent does mention the possibility that some links may appear in more than one location on a page, and links that do will have separate scores for each of those locations. 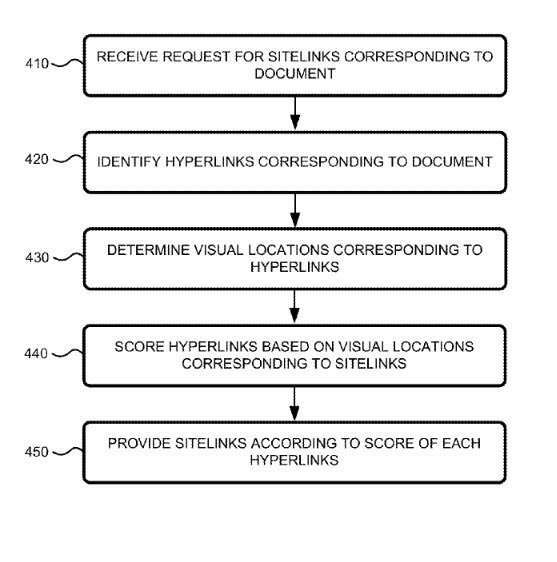 A computing device may receive a request for sitelinks corresponding to a document and identify a plurality of hyperlinks corresponding to the document. Each hyperlink, of the plurality of hyperlinks, may include a hyperlink object within the document. The computing device may determine a visual location corresponding to each hyperlink of the plurality of hyperlinks corresponding to the document, and assign a score to each hyperlink, of the plurality of hyperlinks, based on the visual location corresponding to the hyperlink. The computing device may provide a sitelink, corresponding to a hyperlink, of the plurality of hyperlinks, based on the score assigned to the hyperlink. Since sitelinks may be included in a search engine result, scoring sitelinks according to visual locations and providing the sitelinks according to the score of each sitelink may enable the search engine result to not only include a hyperlink to a document, but also to include sitelinks corresponding to the most visually and/or functionally significant hyperlinks within the document. Accordingly, a system and/or method, as described herein, may be used to enhance search engine results corresponding to a document with one or more sitelinks to improve a user’s search experience. So, it seems that Google is trying to identify significant hyperlinks on a page which it might show sitelinks for. The patent discusses a “sitelink management system” that might be used in the creation of sitelinks for pages. It mentions that to capture some links, Optical Character Recognition (OCR) might be used, and tags associated with links might be looked for. I have noticed some sites that don’t show sitelinks when you search for the name of the site, and links within the main navigation are images and pictures of text, instead of actual textual-based links. 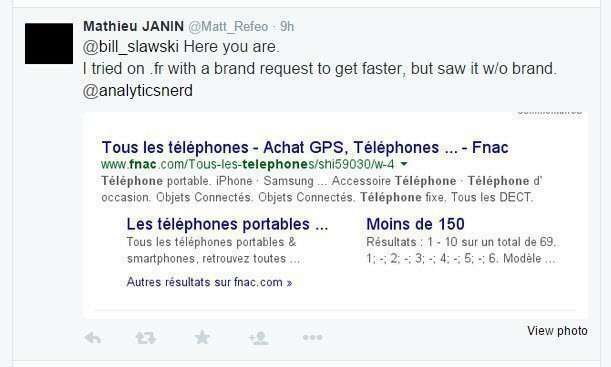 In those instances, it didn’t appear that Google was using OCR to learn where those links led. 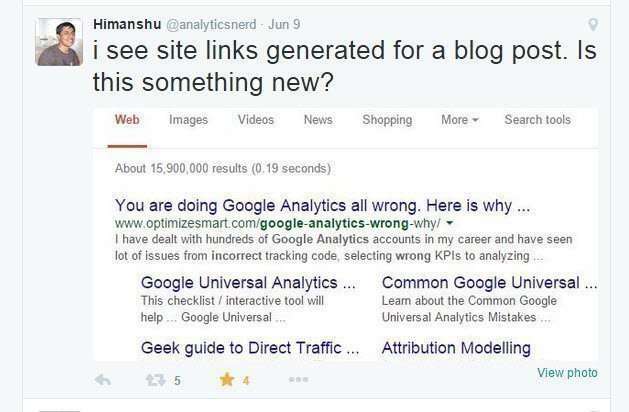 It’s possible that may change, but some self help might be called for to add text that GoogleBot can read to better identify that link. The patent also discusses a “hypertext Markup System” that tracks groups of links that appear on pages, such as a top main navigation set, and a set that appears in a footer on a page that may contain some duplicated links from that top grouping of links. These groups of links may also be scored, and that score may play a role in determining how “visually, or functionally significant” a link may be. Whether or not a site might have sitelinks appearing for it upon a search for it may depend upon whether or not Google is able to determine which links on the home page of a site might be the most visually, or functionally significant those links may be, and Google may also score those links based upon a click through rate associated with them, as well. This is the first Search Engineer I’ve seen with the Surname “SEO”, which suggests to me that he might not have a Google Update named after Him. I looked at the claims sections of the granted patent and the patent application (published after the granted patent was granted, and there are three claims from the granted patent that are marked as “canceled” in the pending patent application. When those appear in the granted patent, they refer to sitelinks showing up in response to a query, and having at least one sitelink for that result. It’s difficult to say how Google was interpreting those particular claims. There didn’t seem to be a lot upon them in the description section of the patent filings. 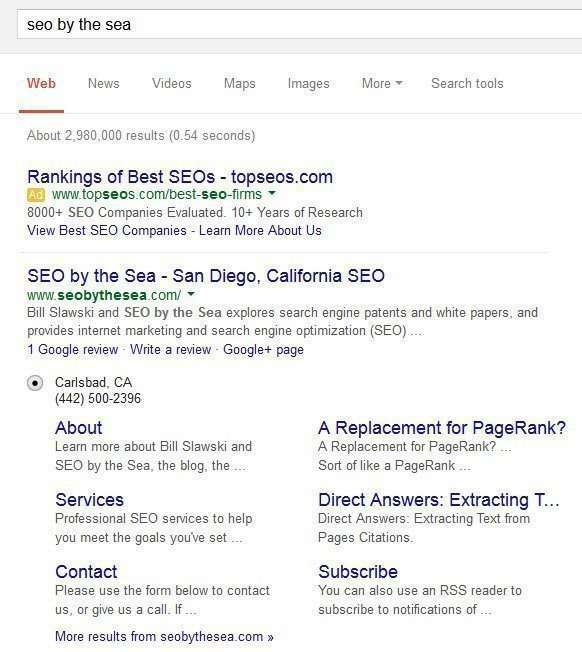 Another set of sitelinks appear in results for the site name SEO by the Sea. Note that some sitelinks are for previously published blog posts, some are for categories, and some are for pages that are linked to in the navigation on the site. Do you have Sitelinks that appear for your domain name, and Site Title; and if they don’t, do you have an idea of how to make changes so that those might start showing up? 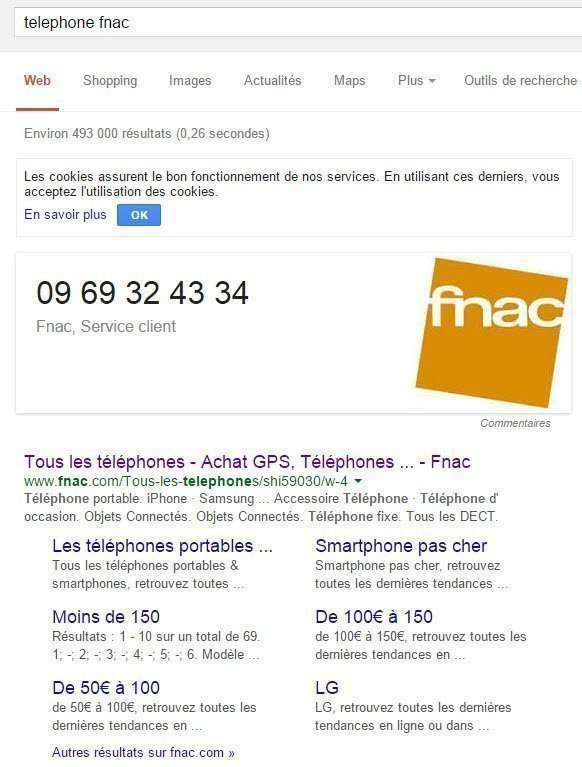 I’ve also published a sum up of this patent, in french, a few hours before your great explanations Bill. I guess that making use of semantic elements like nav or footer could help in the engine’s efforts to score links. The search engine may look at the locations of different links in places like navigation or a footer, and those locations could play a role in their score as potential site links for a page. Another nice post. Always appreciate your insights into Google’s patents. Just to add that being logged in or not, as well as doing a same brand search in speech marks (phrase match) also affects sitelinks. In some cases none appear and in others several appear. There are obviously many factors that influence sitelinks, though I have little doubt that it is indeed predominantly on-page factors that affect their appearance the most. Having recently made quite a few changes to a small site that no longer displays the sitelinks that it once did (though still displaying in other countries), I will be experimenting in this field some more and share any noteworthy observations. I was about to read the latest post you have when my eyes saw this one. I was somewhat interested with this mainly because I had a job last week which concerns about searching various sites using various keywords. While working with it, I encountered this particular dilemma. There are various site links during my searches. What’s funny is, I use almost the same keywords with a small twist like putting spaces in between and not having spaces to the keywords as well. So generally speaking, I was amaze how your post pin-pointed out the things I was curios about in the past. Anyways, as always nice post you have here. Cheers! Another valuable and very insightful post Bill Sir. I did not notice this change on sitelinks and thanks to you, now I will start doing some research and dig deeper into this. It’s really surprising that Google started showing sitelinks for a phrase search in that way. Previously I have been able to get sitelinks on phrase searches but those were shown on a single line just below the description on SERP. But this is new and will start doing some more research on this. Thanks for the information and the post, Bill Sir. I suspect that the results for some queries that are similar to each other might be influenced by those responses to “known queries” at Google. I think that might be true in triggering site links for a site in search results as well. There are various site links during my searches. Previously I have been able to get sitelinks on phrase searches. I was researching on the sitelinks since long and had been on a right place. You’re welcome. Good to hear that you were getting sitelinks for phrase searches. thank you for this knowledgeable and well managed post. Previous Previous post: Google Maps Using Photos to Identify Spam?